I study the element abundances in the solar neighborhood, or within 150pc of the Sun. I have put together the largest collection of nearby, high resolution stellar abundances, called the Hypatia Catalog, which currently has 70+ elements within ~6000 main sequence (FGKM-type) stars as compiled from literature. Hypatia provides a wealth of chemical abundances and kinematic information which has implications for the evolution of our nearby galaxy, the formation of planetary systems, and astrobiology. Through ASU's NExSS research network and the VIDA program at Vanderbilt, an independent database has been created to make the Hypatia Catalog available to the community and the public. The database is free to access and includes all of the current data, including individual literature sources, all elements and species, downloadable data, and an interactive plotting tool. The database is complete and can be accessed at www.hypatiacatalog.com. You can also follow on Twitter: @HypatiaCatalog. 4) To understand how well an element is measured within a star, the best indicator is given by the range of all of the measurements for that element by different techniques/groups. This range or “spread” is listed in the table in lieu of a the more traditional “error bar,” which varies in it's calculation and implementation depending on the methodology/paper. The abundance measurements in the Hypatia Catalog were combined from 150+ different literature sources, as listed in the Hinkel et al. (2014, 2016, 2017) and also given here. While the Hypatia Catalog was put together as part of my dissertation at Arizona State University (awarded in May 2012), I update the backend to make it modular and flexible such that I can continue to expand and maintain the database as more abundance determinations and physical properties are made available. All of the data within Hypatia is available online at www.hypatiacatalog.com. Please feel free to contact me if you have any questions, issues, or suggested improvements. I named my stellar abundance catalog after Hypatia, one of the first known female astronomers who was born between 350-375 AD in Alexandria and died around 415/6 AD (Deakin, 2007). Hypatia was an extraordinarily strong and independent woman, especially for the time. She was known to teach publicly from her house, covering astronomy, mathematics, and philosophy, and was highly regarded in Alexandria. Said Damascius, "In speech articulate and logical, in her actions prudent and public-spirited, and the rest of the city gave her suitable welcome and accorded her special respect." From Socrates Scholasticus: "She not infrequently appeared in public in the presence of the magistrates. Neither did she feel abashed in coming to an assembly of men. For all men on account of her extraordinary dignity and virtue admired her the more." She worked closely with her father, Theon, on a number of editions and commentaries (seen as a sort of "student guide") on the works of Euclid's "Elements"and Ptolemy's "Almagest." After his death, she continued her work with her student Synesius of Cyrene, improving on the theories and designs they had established. While a number of books of hers have been destroyed or damaged throughout the years, much of what is known of the woman and her work are through letters corresponding with Synesius. From the letters we learned that Hypatia had a hand in designing the modern version of the armillary sphere and astrolabe (to predict the motion of nearby planets and stars) as well as the hydroscope or hydrometer (to measure the density of fluids). A beautiful and unwed woman, Hypatia was a Neoplatonist who took an oath of chastity and, as a result, was not interested in the many suitors who admired her and her work. One story -- not for the faint of heart -- described an ocassion when a colleague or student fell in love with her and made his affections known. She responded to the man by showing him her menstrual "napkin," a clear indicator of her celibate lifestyle, saying, "It is this you love, young man, not beauty." According to Deakin, "…it makes perfect sense for a Neoplatonist, committed to transcending of the material world, to embrace a lifestyle that minimized her involvement with it." Bust of Hypatia at Lowell Observatory, courtesy of Gerard van Belle. 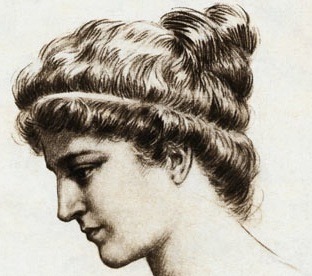 Hypatia died in the midst of a religious power struggle in Alexandria. Around 412 AD, Cyril of Alexandria became archbishop, systematically targeting the Novatians and then the Jews for heresy against the Christian church. Orestes, the Christian civil governor, tried to mitigate the tensions by adopting a more tolerant and pluralistic standpoint. In doing this, he sought Hypatia's advice, making her a clear target for Cyril. In 415/6 AD, as Hypatia was on her way home, a group of Christian extremists dragged her from her carriage and into a church where they stripped her and beat her to death with tiles. They then tore her body apart and burnt the remains. Hypatia was killed brutally, however, the manner of her death should not overshadow her determination and bold personality. What little is known about her research and her personality is still impressive. Deakin said it well: "By competence and by force of personality, she could command a crowd; her popular lectures and charismatic presence drew the multitudes. She held the ear of the legitimate authority and was heard with respect." Almost 1500 years later, these are traits still sought by scientists, especially female scientists, and they are something for which to strive as a professional. So it is with great reverence and appreciation that I invoke her name for my catalog of stellar abundances. For a nice summary of Hypatia's life and achievements, please go here. And for more information, read "Hypatia of Alexandria: Mathematician and Martyr" by Michael A. B. Deakin (2007), which was quoted and used as a reference above. Additionally, Hypatia was a prominent character in the interesting time-travel science fiction novel "Weighing Shadows" by Lisa Goldstein. Also, a comic about Hypatia!